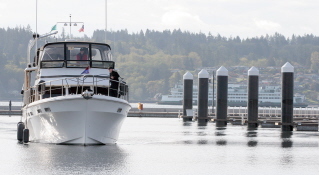 At 8:30 this morning Phil Mhoon of Bremerton steered his 48-foot Ponderosa boat named Luna III away from the Bremerton Marina breakwater into his new permanent slip. He was the first tenant at the Port of Bremerton’s new docks. Most readers of this blog will recall the marina is being paid for by you residents within the port district through an Industrial Development District tax. The tax is part of the property tax levy. No one, including me, noticed the window within which residents would have a chance to call for an election to overturn the port’s decision. It may take years, decades probably, before the ill feelings subside. I understand if you want nothing to do with the place, but if I was paying several hundred dollars over six years for the facility, I might try to do what I could to enjoy it. If you can find a place to park in Bremerton, the marina would be a nice place during nice weather to enjoy a lunch outside. The breakwater, which makes the passing ferry wake faint, if at all noticeable, has four picnic tables. During festivals there will be room for booths to be set up. Speaking as someone who finds some comfort, or something like it, from water, the marina has made the waterfront something more people can access. The public portion will be open from 7 a.m. to 5 p.m. at first. Eventually they’ll keep the place open until 10 p.m. The port’s marine facilities director, Steve Slaton, said you really have to see the docks at night. Slaton said the port’s business plan is to have the place filled with permanent tenants within four years. So far 50 slips are pre-leased. Mhoon has been splitting time between the marina at Port Washington Narrows and Port Orchard. He and his son Jeff plan to make their boat available for time-sharing and cruises, marketing through the Elliott Bay Yacht Club. About a half hour after the Mhoon’s arrived a second boat found it’s place. Marina manager Kathy Garcia said six permanent residents were planning to tie in today, including three liveaboards. Slaton said the docks will be filled for the May 31 grand opening. Memorial Day weekend the week before might also be a busy spell, as well. At least some of the unsold permanent slips will be available for visitors for the time being, he said.